SonicWALL Email Security (SES) is available as a hardware appliance, Windows server-software, and virtual appliance in a VMWare® environment; as a cloud-based solution through SonicWALL partners; or as a hosted hybrid-cloud solution with the Comprehensive Anti-Spam Service on our SonicWALL TZ, Network Security Appliance (NSA) and E-Class NSA appliances. Uniquely scalable, flexible and redundant, SES works in stand-alone, distributed or clustered deployments. The highly flexible architecture of SES delivers scalable, redundant and centrally managed multi-location e-email protection that can be managed easily and centrally. The deployment and operational flexibility of SonicWALL Email Security allows organizations to protect both inbound and outbound email in the most comprehensive and cost-effective manner available. 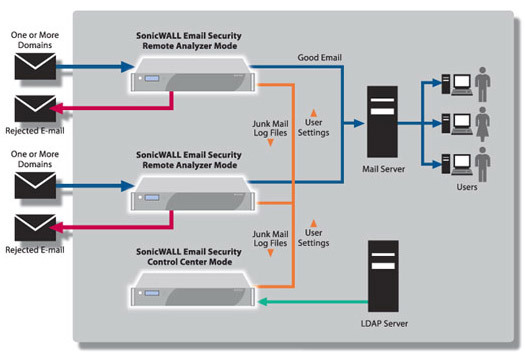 The basics of SonicWALL Email Security deployment. 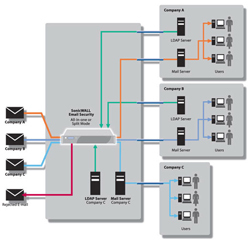 SonicWALL Email Security can be deployed in either all-in-one or split mode. In split mode, a system can be a remote analyzer or a control center. A typical split-mode setup is one or more remote analyzers connected to a control center. The remote analyzer receives email from one or more domains and applies connection management, email filtering (anti-spam, anti-phishing and anti-virus) and advanced policy techniques to deliver good email to the downstream email server. The control center centrally manages all remote analyzers, and collects and stores junk email from the remote analyzers. Centralized management includes reporting, and monitoring of all related systems. 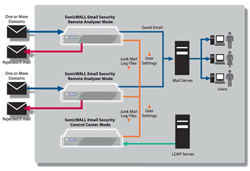 Below are sample deployments for SonicWALL Email Security. Of course, every organization is different, but the deployments below demonstrate the flexibility and scalability of the SonicWALL Email Security solution. Centralize domain management with a multi-domain, multi-LDAP deployment. 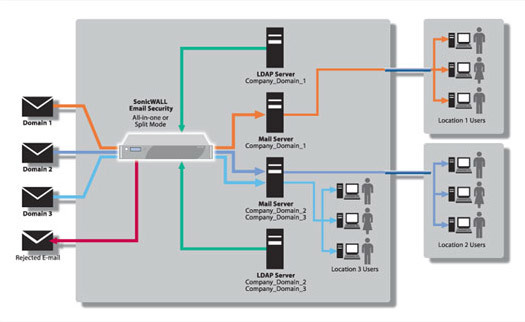 This deployment shows how SonicWALL Email Security can centralize the management of multiple email domains that utilize one or more LDAP servers and one or more email servers. Organizations such as medical consortiums, insurance companies, franchises and multi-brand/multi-division companies are often candidates for such a configuration. Centralized management allows for simplified application of corporate email policies, with the ability to apply policies easily on a per domain/group/user basis. Reporting is also centralized with per domain reporting available. Multi-location, central control deployments for distributed organizations. 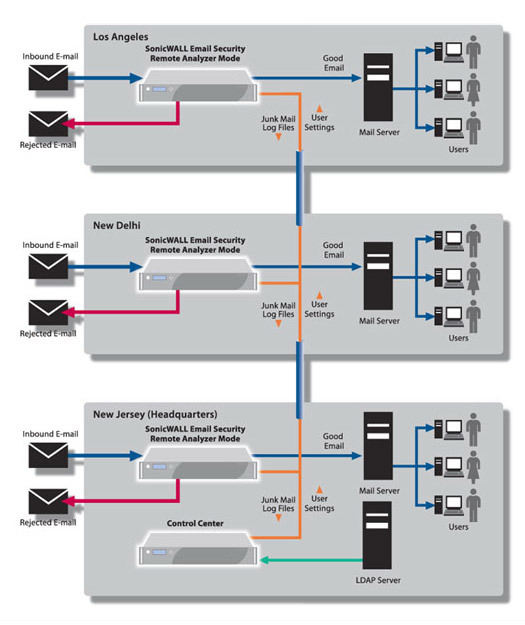 This deployment is typical of distributed organizations where the optimal-location for processing email-centralized versus local-is critical. 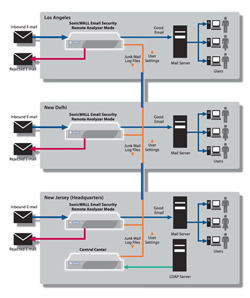 The flexible SonicWALL Email Security architecture enables a solution that fits the unique needs of any distributed organization. This type of deployment is often found in organizations with multiple locations or organizations that have added locations through an acquisition. The local processing of email to remove the "junk" reduces overall network traffics while the centralized management ensures corporate control. 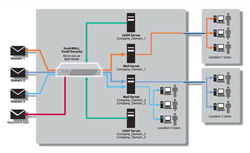 An added benefit is that the remote analyzers can be "clustered" for failover from location to location if desired. Flexible deployments for the Managed Service Provider. A Managed Service Provider (MSP) can provide email-filtering services for their clients and possibly email server services as well. The SonicWALL Email Security solution is flexible enough to allow for multiple domains that can be centrally managed by the MSP, but still allows a given client to have their own users, policy rules, junk boxes and more, all under the control of the MSP. Reporting is centralized, but can be done on a per-domain basis as required. 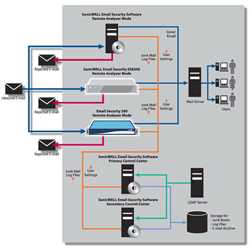 Outbound email can be routed through the SonicWALL Email Security system for some or all clients as desired. In addition, the flexible architecture allows the MSP to start with single system and easily move to the fail-over enabled, split-mode architecture as their business grows. MSPs can easily deploy additional virtual appliances for new or existing customers with minimal incremental investment. Scalable and redundant deployments provide peace-of-mind.